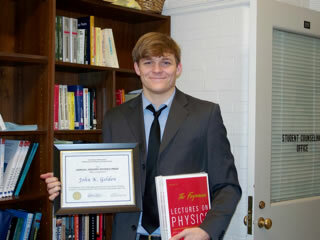 The Department of Physics is pleased to announce the winners of this year's undergraduate awards, including the National-level Winston Churchill Foundation Scholarship, the Honors Physics Prizes, the John Castle Jr. and John Radu Scholarships, and on behalf of Phi Beta Kappa, the Iota Book Awards. This prestigious scholarship, offered this year to just 14 students nationally, will enable Kristin Beck to pursue graduate work at Cambridge University this fall. 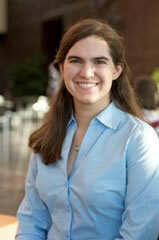 Kristin plans to study quantum optics in the Cavendish Laboratory under the tutelage of Michael Kohl. The Scholarship covers all tuition and fees, and it provides about $20,000 for living expenses and travel costs. Currently, Kristin performs quantum optics research in Professor Bigelow's lab, and she spent last summer in Geneva, Switzerland at CERN, working on the LHC through the REU program. For the first time in Department history, three students have won Honors Physics Prizes, which are awarded to students with top performances in the Honors Physics sequence -- PHY 141, 142, 142, and 237. The faculty members teaching the Honors sequence formally nominate the students, with the Undergraduate Award Committee making final decisions. 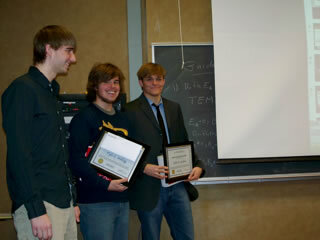 This year's winners are John Golden, Brad Christensen, and Tyle Stelzig. Currently, John performs quantum optics research in Professor Bigelow's lab, and he has also done research on LIGO and other projects through the REU program. Tyle's previous awards include the Iota Book Award in 2007. Currently, he performs research in Professor Schroeder's lab. The need-based John Castle Jr. Endowment Scholarship is awarded to the Junior with the highest GPA and is applied toward the Senior year of tuition. Jonathan Kurvits is this year's winner. He has been working in Professor Howell's lab from Fall 2006 through Spring 2008. The need-based John Radu Endowment Scholarship is awarded to the Sophomore with the highest GPA and is applied toward the Junior year of tuition. Timothy DeHaas, class of 2011, is this year's winner. 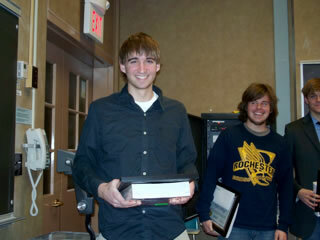 He held an REU position at SUNY Oswego during the summer of 2008. 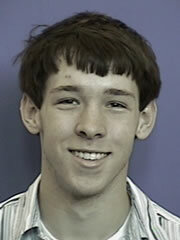 Gregory Bentsen currently has a GPA of 4.00, ranking him in the top 99% of the Class of 2011. 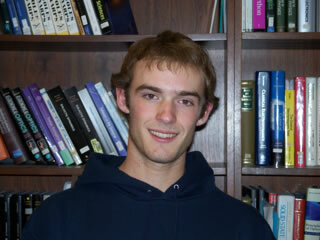 Greg is a member of the Society of Physics Students and a volunteer SPS tutor on Monday and Tuesday nights. 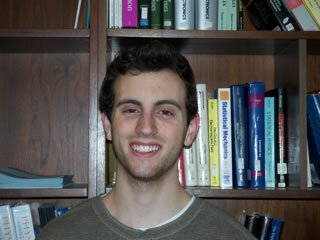 He's also a TA for ECE 112 and a member of the Renaissance Scholars Steering Committee. During the summer of 2008, he was a Research Assistant for Professor Doyley. Mentorship and teaching are key ingredients to leadership, and Greg has proven his skills in both areas. Stephen Keeley currently has an overall GPA of 3.99, ranking him in the top 97% of all students in the Class of 2011, and a 4.00 GPA in Physics, placing in the top 98% of the Physics Class of 2011. During his first semester in fall 2007, Stephen took six courses, served as a volunteer tutor for the Society of Physics Students, and performed research with Professor Bigelow. During his second semester of freshmen year, he took seven courses. In addition, he is a Boy Scout Leader and member of the University of Rochester Men's Glee Club. Interested in Medical Physics, Stephen also has a serious interest in film and developed his own holographic film with chemicals. During the summer of 2008, he was a volunteer deck manager of the JCC's West Side Story Production. Donald Polaski currently has an overall GPA of 3.94, ranking him in the top 93% of all students in the Class of 2011, and 4.00 GPA in Physics, placing him in the top 97% of the Physics Class of 2011. Since Donald enrolled at the University of Rochester, he has been an Assistant Scout Master for Troop 133 in Churchville, New York, as well as a member of the University of Rochester Television campus channel, a member of the Undergraduate Philosophy Council, and a member of the University of Rochester BASIC. 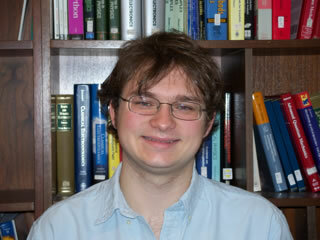 He also serves as a volunteer tutor for the Society of Physic Students on Monday nights. 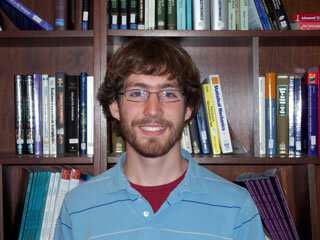 Since fall 2008, he has been doing research with Professor Krauss. 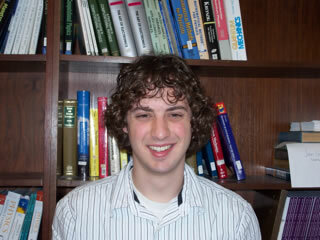 In spring 2008, he became the Public Relations Manager for the Society of Physics Students. 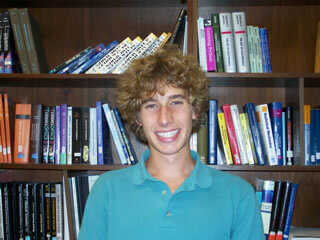 Marek Slipski currently has a GPA of 4.00, ranking him in the top 99% of the Class of 2011. Marek has been doing research with Professor Alice Quillen, and he's also involved in Residence Hall Intramurals, the National Society of Collegiate Scholars, the Cross Country Team, and the Ultimate Frisbee Club. He serves as a tutor for the Society of Physics Students. In addition to Physics and Astronomy, Marek loves Philosophy and Mathematics and talks about possibly pursuing a degree in both. Patrick Sheehan currently has a GPA of 4.00, ranking him in the top 99% of the Class of 2011. He has been doing research for Professor Watson since he was a freshmen in fall 2007, and he's also a member of the Society of Physics Students.